If you’ve tried the Windows 8 Developer Preview and found you don’t like the new Start menu, Windows Explorer, and Task Manager, there is a way to make those items look and act like Windows 7. 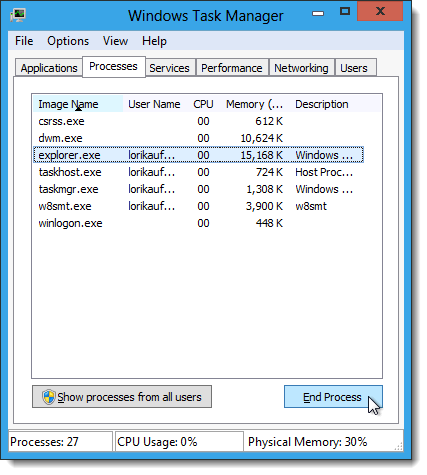 This article shows you how to bring the Windows 7 Start menu, Explorer, and Task Manager to Windows 8 using two methods, a registry hack and a third-party tool. 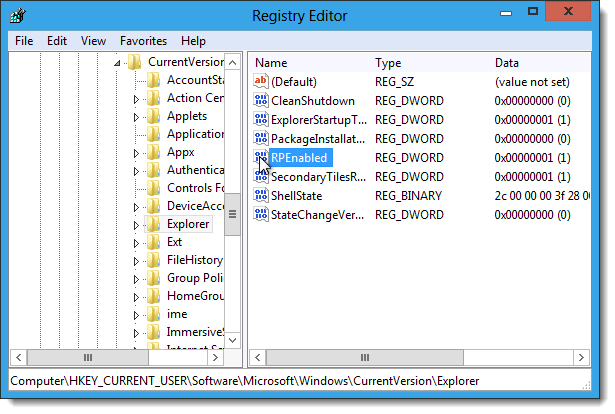 To bring back the Windows 7 Start menu, Explorer, and Task Manager by changing the registry, press Win (Windows key) + R to access the Run dialog box. Enter “regedit” in the Open edit box and press Enter or click OK. Select the Explorer key on the left and then double-click the RPEnabled value on the right. 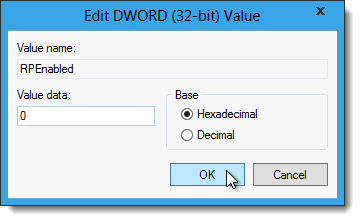 On the Edit DWORD (32-bit) Value dialog box, change the value in the Value data edit box to 0 and click OK. The value “0 “ turns off the Metro UI and activates the classic Start menu and the value “1” activates the Metro UI, turning off the classic Start menu. The Task Manager changes immediately to the classic style. However, you must restart Windows Explorer to allow the Start menu to change. Because the Task Manager is now in Windows 7 style, restart Explorer as you would in Windows 7, using the Classic Close Explorer Method. If you are changing back to the Metro UI (changing the RPEnabled value back to 1), the Task Manager will display in the new style, and you’ll have to restart Explorer using the Windows 8 Task Manager. Once you’ve restarted Explorer, the classic Start menu is available. NOTE: When you switch to the Classic Start Menu, any open Explorer windows are not affected by the change. To see the classic Windows Explorer, close any open Explorer windows and open Explorer again. To change back to the Metro UI, go back into the registry and enter “1” as the value for the RPEnabled key again. 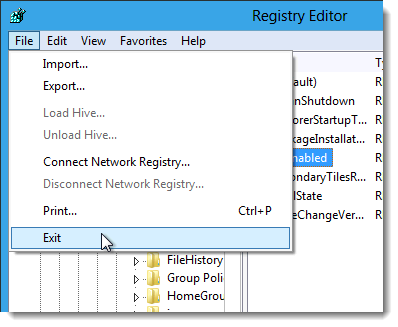 The registry hack for getting back the classic Start menu we just showed you above is fairly easy; however, there is an even easier way to switch to the classic Start menu. There is a tool, called Windows 8 Start Menu Toggle, that allows you to quickly switch between the Metro UI and the classic Start menu by clicking a button. See the end of the article for the download link. 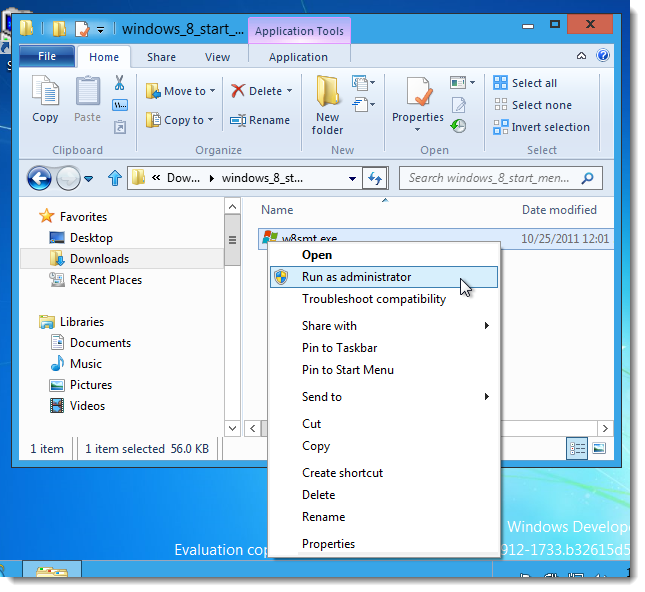 To use Windows 8 Start Menu Toggle, you must run it as Administrator. 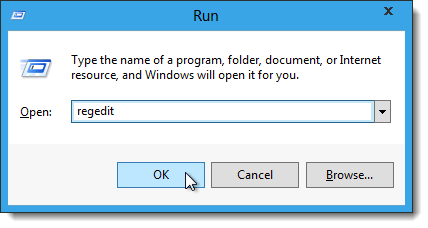 Extract the .zip file you downloaded, right-click on the .exe file, and select Run as administrator from the popup menu. 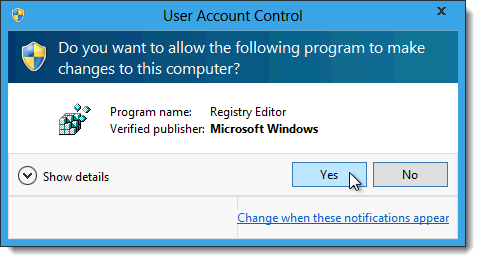 Again, if the User Account Control dialog box displays, click Yes to continue. Windows 8 Start Menu Toggle is a portable program that does not need to be installed. 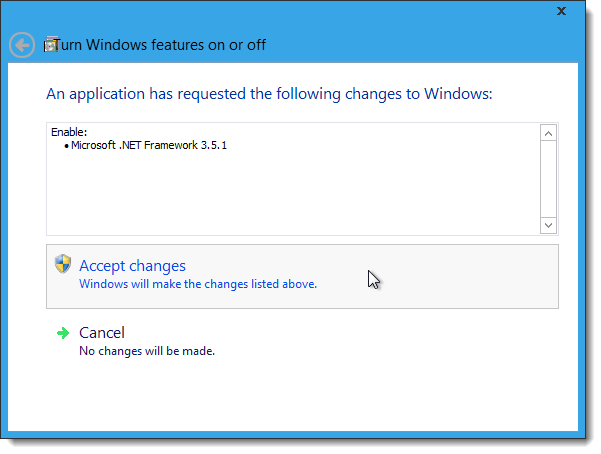 However, the first time you run it, the program will prompt you to install the Microsoft .NET Framework 3.5.1, if it is not already installed. Click Accept changes to continue with the installation. 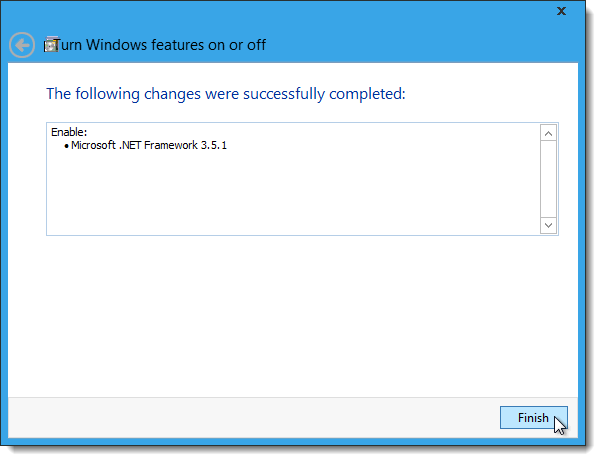 To install the .NET Framework in Windows 8, you must connect to Windows Update. 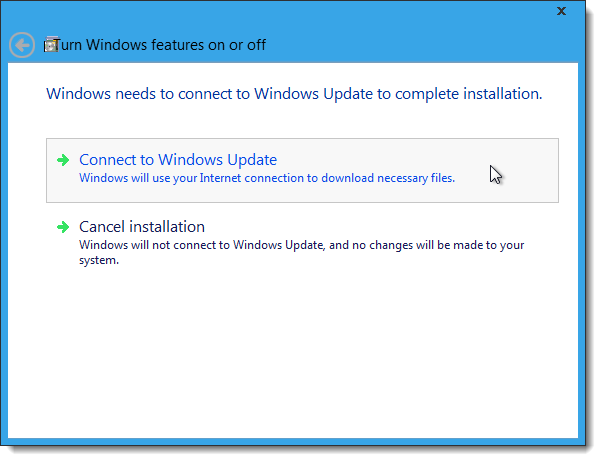 Click Connect to Windows Update to allow Windows to connect and download and install the required changes. A dialog box displays while the updates are downloaded from Windows Update. When the download and installation is done, the following dialog box displays. Click Finish. To run Windows 8 Start Menu Toggle, double-click the same w8smt.exe file you ran before. 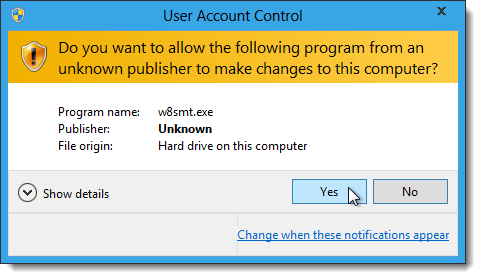 A small dialog box displays with one, big button on it. If you are currently using the Metro UI, the button reads Use Classic Start Menu. Click the button to hide the Metro UI and use the classic Windows 7 Start menu, Explorer, and Task Manager. NOTE: You do not need to restart Explorer for the changes to take affect. If the Start button does not seem to change move your mouse over it and click it. It should change to the classic Start menu. It may take a few moments. 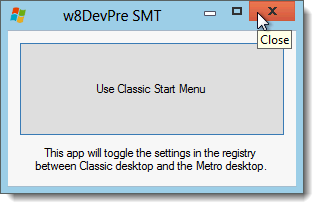 While you are using the classic Start menu, the button in Windows 8 Start Menu Toggle reads Use Metro Start Screen. 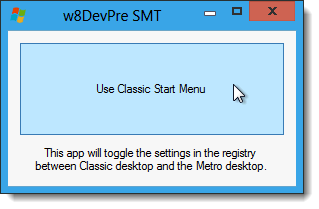 To hide the classic Start menu and return to the Metro Start Screen, click the button. 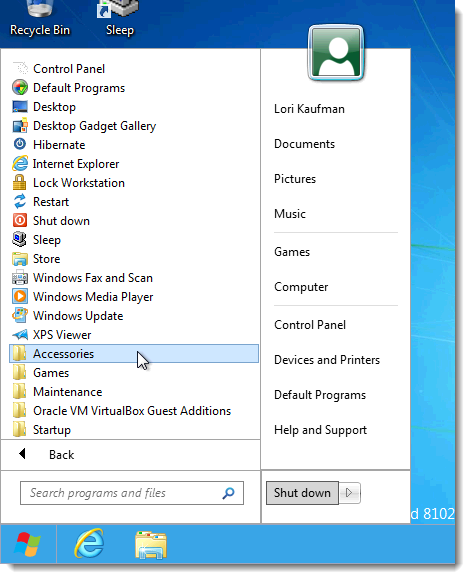 To close Windows 8 Start Menu Toggle, click the X button in the upper, right corner of the dialog box. Now, you can play around with the Metro UI in Windows 8 and easily switch to the classic interface from Windows 7 when you want to actually get anything done. 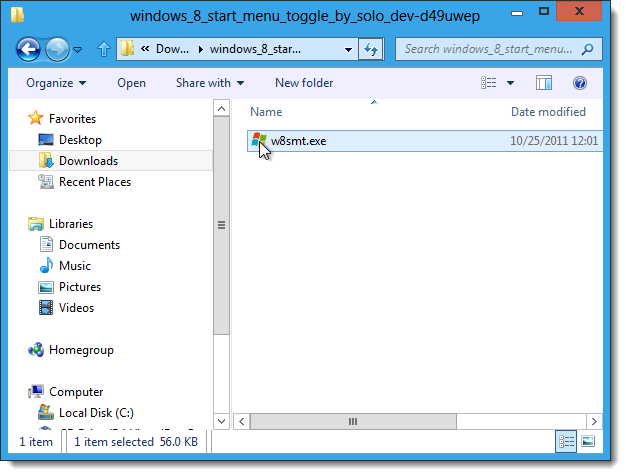 Windows 8 Start Menu Toggle by ~Solo-Dev on deviantART.